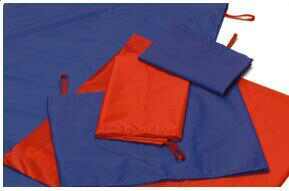 A slide sheet is a very slippery piece of material made from a strong synthetic material approximately 100 cm  150 cm. The sheet does not have any seems or hems to interfere with skin integrity. AHCN recommend that you use 2 slide sheets as described below. To use a single sheet simply fold the sheet in half and roll it under a Resident, similar to fitting a draw sheet. When moving the Resident ensure the sheet is in the correct position, the evironment is clear of obstacles, the bed is adjusted for free movement (i.e. flat or sloping in the direction of movement) and the Resident is aware of waht is going on and co operative. 2. Tuck the two open ends of the Slide Sheet as far as possible under the Resident , it is helpful if the resident lay on their side or sit up using the mechanical back to firstly raise the Resident and another staff member to hold them up as you place the sheet underneath them. In particularly immobile Residents you can place the slide sheet under the bed sheet or use two large slide sheets under the bed sheet. Note the resident does not need to roll all the way over the get the sheet underneath them. 3. Roll the Resident onto their back, ensure the slide sheet is under the hips and shoulers and correctly overlapping. (4) 1-2 carers pull the top layer of the sheet to turn or transfer the Resident. The Resident should move freely. (5) Scrunch the sheet and pull it out at 90 degrees to the open edge.